Sometimes, it may be required to send E-Mail notifications about changes in critical system directories or files. 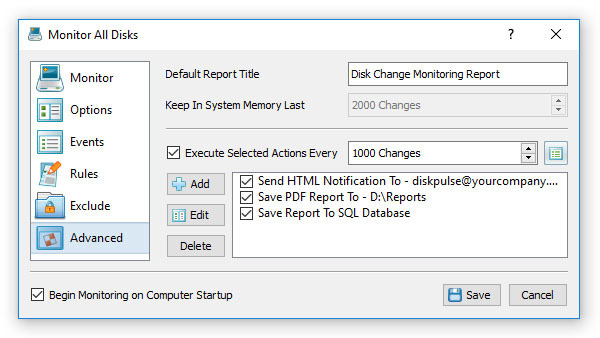 In order to enable E-Mail notifications for a disk change monitoring command, open the monitoring command dialog, select the 'Advanced' tab, enable disk change monitoring actions and specify the number of file system changes that should trigger the specified notifications actions. Now, press the 'Add' button and add an E-Mail notification. Every time the specified number of file system changes will be detected, DiskPulse will send an e-mail notification containing a list of detected file system changes to the specified e-mail address. 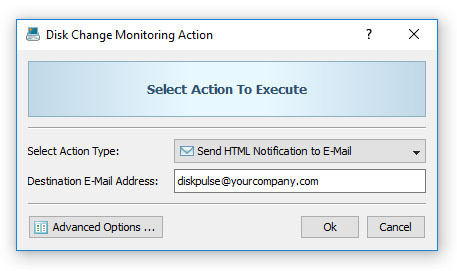 After each e-mail notification, DiskPulse will clear the change list and restart the disk monitoring operation. In order to send multiple notifications to different E-Mail addresses, just add a number of notification actions with each one configured to send notifications to a different destination E-Mail address. 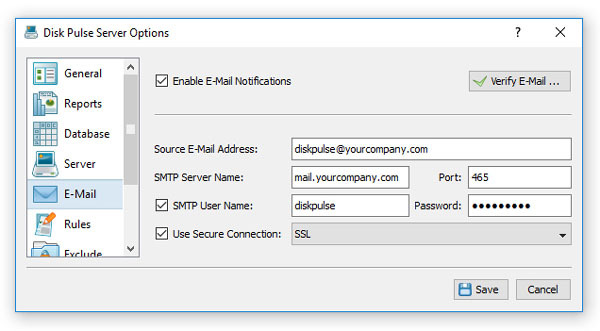 Finally, open the 'Options' dialog, select the 'E-Mail' tab, enable E-Mail notifications and specify an SMTP server and a valid e-mail account to sent notifications through. Once finished configuring the SMTP server, press the 'Verify E-Mail' button to verify the specified server host name and E-Mail account.